The recent selection of a running mate by candidate Romney has prompted at least a few news outlets to consider the basic ideas behind the GOP campaign for control of both the Executive and Congressional branches of government. One of those ideas is the notion of "individual responsibility". On the face of it, the words "individual responsibility" could be taken as a call to accept responsibility for the consequences of one's own actions and for the effective, efficient, and responsible workings of both government and the parts of our economy within which we are involved, aspirations Democrats would most likely applaud. But unfortunately, more often than not, those same words are being bent in meaning by GOP candidates, fans, and pundits to something closer to the notion of "self-reliance". "Self-reliance", of course, has meaning more like "don't ask for help, because you ain't gettin' any" and suggests it is the natural order of things that consequences happen, like it or not, "so get used to it". To the basically selfish, greedy, and socially irresponsible such a message sounds very appealing, justification for their ethic "to winners go the spoils and all else be damned". The odd thing is that within certain circumstances, the notion of self-reliance can be a guiding and strengthening virtue. Back in wilderness days that notion was appropriate. Separated from the group, from civilization, people had to rely on their own efforts and ingenuity to survive. Pioneering America was very much like that. But such wilderness circumstances do not exist today. Today, we are steeped in civilization and any wilderness areas that remain have been proven essential both to the health of our planet and the survival of our species. Today, we need individuals to be socially responsible far more than we need them to be self-reliant. We need them to consider the consequences of their actions and trust that others will do similarly so that all or at least most of us will survive. The individual pictured above appears to be both an immigrant and citizen of the United States. He is also a wounded war veteran who has suffered the loss of an arm. 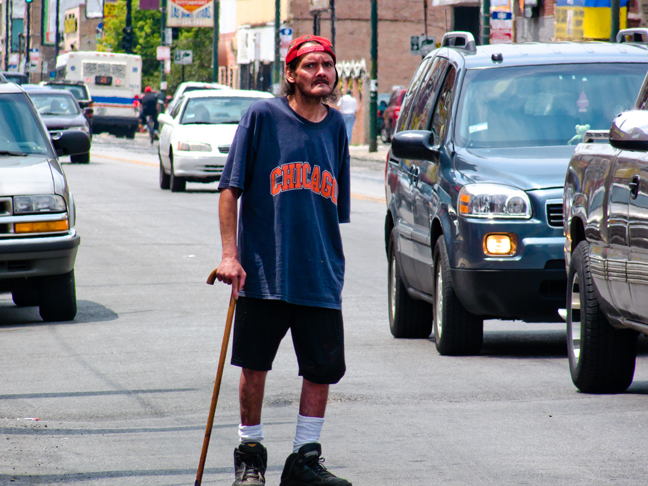 He apparently isn't homeless but is for the most part unemployed, often seen pan-handling in traffic along the streets of Chicago's near southwest side. He has put in his time and made his sacrifice for the group. But what now does the group offer him in return? A chance to compete, for sure. But is a chance to compete enough? Is setting him down outside the group and letting him loose to fend for himself really the fairest healthiest return we can afford to offer? And should he be satisfied with what others might call "God's will" that he flounder, suffer, and finally perish though he try to compete in a world he is now ill-suited for? More clearly, it is we who have failed to foresee and prepare for the consequences he now endures. He is one of us, but least we be accused of "nannyness" we slough him off in our failing to find a viable meaningful place for him amongst our numbers. He has been exploited. So we now discard him, telling him it is his role to be "self-reliant" while we enjoy the benefits of sharing amongst ourselves, things like bridges and roads, sewers and clean water, farm subsidies and tax breaks, and a massive national defense structure. No, that notion of "self-reliance" is, in today's world, a perverse self-serving travesty that reveals its adherents to be, even in the best of light, socially irresponsible individuals personally prospering by exploiting the willingness of others to sacrifice for the good of the group. You'd think we could see and do better for ourselves.